Today I was on a panel about the potential societal impacts of VR/AR. The moderator first asked me what are some potential positive outcomes. So I described a scenario, perhaps five years from now, when ubiquitous wearables will allow us to return to face-to-face conversation, something our evolution has wired us to do very well, rather than spending our time staring at screens. Then he asked me about potential negative outcomes. I said it’s possible that people will merely pretend to engage in face-to-face conversation, while they are actually reading their Facebook feeds. Whether that happens, I pointed out, is not up to technology, but up to us. But then later in the panel the moderator asked whether there were some really nightmare scenarios for advancing technology. So I told him one that’s not really about AR or VR. Two weeks from today (on December 14), the FCC is likely to do away with Net Neutrality. When that happens, Comcast will be in its rights to refuse internet service to any content provider if there is a legal cloud over that content. So in one scenario, the President tweets that CNN is fake news, and the Justice Department promptly issues an indictment against CNN for fraud. While that case is wending its way through the courts, Comcast does not carry any CNN content. In a democratic society, if only one party controls what information citizens can see, that party is guaranteed to win elections. The party in power then becomes locked in, and the society remains a democracy in name only. So that was the answer I gave. Between you and me, I don’t think the tax bill was the end game. I think this is. Today I was at a meeting where the person who spoke before me started out by describing themselves as an autodidact. I was impressed. I have always admired autodidacts, and have wondered how they manage to achieve so much. Since I was the next person to speak, I took the opportunity to express my admiration. I explained to everyone that I had tried to teach myself how to be an autodidact, but had not managed to do it. And now I’m wondering, does somebody give a course on-line that can teach you how to be an autodidact? If so, I’d sign up for it in a minute! When I was a child, I used to wonder about Tony Romeo. I’m guessing you don’t know who Tony Romeo was. He was the guy who wrote the monster hit for the Partridge Family I Think I Love You. He also wrote lots of hits for many other recording artists, as well as an impressively large number of TV commercial jingles. I was the sort of little kid who wondered about the people nobody else was paying attention to. So when I saw the cover of the Partridge Family album, and decided that I Think I Love You was my favorite song on it, I began to wonder about the songwriter. Also, “Tony Romeo” is a very cool name. To my twelve year old mind, a name like that conjured up glamour, intrigue and maybe even international spy stuff. This morning, prompted by the recent sad demise of David Cassidy, I started looking on the Web for more info about Tony Romeo. I found discovered that he had tried to start his own singing career, but that it never gotten anywhere, and that he died in relative obscurity in 1995. Curiously, searching on Google for “Tony Romeo” and “I Think I Love You” didn’t produce any photos of him. Although, not surprisingly, there were lots and lots of images of the young David Cassidy’s eerily pretty face. I finally had some luck when I abandoned the ersatz Partridge Family and started looking for songs Romeo had written for The Cowsills, the real musical performing family that the fictional Partridge Family was based on. 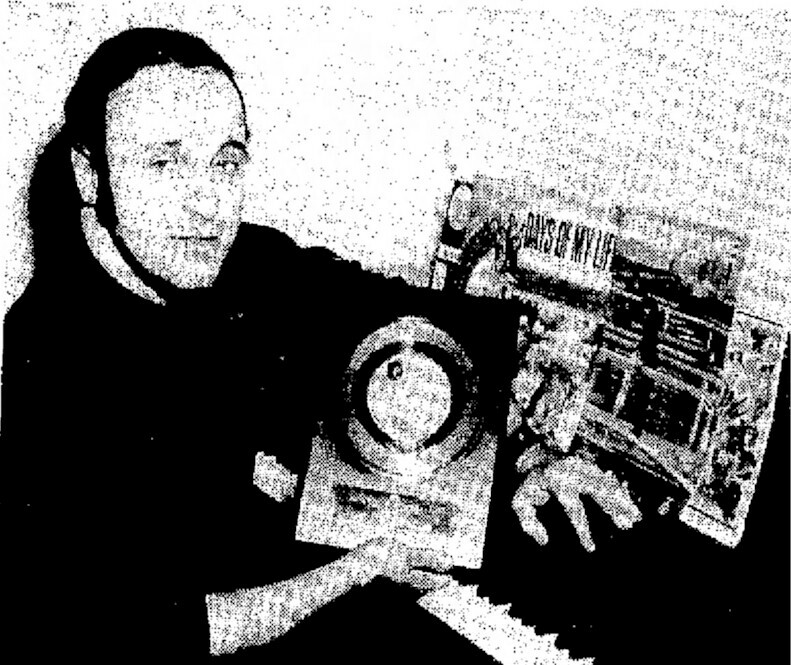 That’s when I hit pay dirt: A single photo of Mr. Romeo proudly holding up his first ever golden record, for “Indian Lake”, a hit for The Cowsills in 1968. It’s strange, isn’t it? Tony Romeo created a sound that was widely imitated, and his work is fondly remembered by millions. Yet he was never in the limelight. And now the man himself has largely been forgotten. I wonder how many people like that there are in our culture — just around the corner from famous. This weekend’s Saturday NY Times crossword puzzle was a real killer. Maybe it’s just me, but I found it to be the most difficult Saturday crossword in years. Usually these days I can finish Saturday in about 20 minutes, and sometimes it can take 30 minutes. But parts of this one had me completely stumped. I wondered whether I had finally met my match. But then I remembered that I have a friend who is much smarter than I am. When I really need him he’s always there, and we sort of work tag team. So last night I went to bed, hoping that my smarter friend would be able to get to work while I got some shut-eye. I had a few fitful dreams, but woke up in the morning feeling refreshed and ready to face the day. I brewed myself a fresh cup of coffee, picked up the Saturday paper, and within a few minutes had polished off the puzzle. Sometimes your friends will let you down, but this one never has. How would you define a “perfect movie”? My definition is a film that perfectly achieves the goals that it had set out to achieve. This is actually quite rare. Most films are flawed in one way or another. This can be due to accidents of casting, production schedules, mishaps on set, flawed screenplays, or just the astonishing stupidity of self-important studio execs who try to “fix” a movie, and end up destroying it. Today I saw a perfect film — Pixar’s Coco. I do not say this lightly. It is quite rare that I see a film which perfectly achieves its goals, without a single misstep. Of course the subject matter helped. Rather than focus on the shallow culture of these United States, Pixar chose to situate its story in Mexico. As I’m sure you know, Mexico is a far richer and more mature society than ours. Family connections there are much deeper and more developed, and emotions are undergirded by the resonance that derives from centuries of cultural continuity. Relatively speaking, we are like little children here in the U.S., playing at being a culture. Mexico has an actual grown up culture, and I suspect they look upon our antics with tolerant amusement. I was also delighted to see a Pixar film focused on Dia de Los Muertos. We did a version of that theme in our research lab back in 2015, as a collocated immersive Virtual Reality experience. Here is a link to our take on it. Two interesting related events happened on this day in history. On November 24 1859, Charles Darwin published On the Origin of Species. Then on November 24, 1974, Donald Johanson and Tom Gray discovered “Lucy”, a forerunner of homo sapiens who lived 3.2 million years ago, and the earliest of our known forebears believed to have used stone tools. The Origin of Species was, in its way, also an evolution of the human use of tools — in this case, the tool of objective evidence based science. The subsequent discovery of Lucy, like many other such discoveries, was solid empirical confirmation of the predictive power of that science. I think of the publication of Darwin’s book as an event both humbling and exalting. It was humbling because it asked us to set aside cherished myths about our uniqueness in the order of things. It was exalting because that very humility was a call to evolve into our best selves. We were being asked not to flinch from objective evidence, but rather to embrace it. The courage to embrace truth, wherever that truth may lead, is one of the noblest qualities a human may possess. From the time I was a teenager, I understood that we are a morally compromised country. I suspect we have that in common with many countries. Our society is built on a legacy of the twin horrors of slavery and genocide. What we invaders from Europe did to non-Europeans was unspeakable — both the non-Europeans who were already living here and the ones we imported to be our pack animals. But I’d sort of made my peace with it because the ideal of America was something that made sense to me. This ideal includes the notion of equality, a welcoming attitude toward strangers, a society where people are treated equally, have a voice in their government, and believe in a fundamental principle of fairness and opportunity. Yet the monstrous current inhabitant of the Whitehouse has shaken my faith in that compromise. It’s not that he is a venal narcissist, a con man, a vile bully desperate for attention. That’s unfortunate, but it’s not the problem. It’s more that his policies reflect our ugly past rather than any hopeful future. The vicious attacks upon blacks, latinos, immigrants and others who are vulnerable — not so much the ugly words (although those are bad), but the hurtful policies. The cabinet appointments that all read as somewhere between a bad joke and a deliberate insult, the naked attempt in this current tax bill to line the pockets of the extremely wealthy by hollowing out the middle class, the approach to healthcare that pretty much says “if you’re poor, you die.” The sheer blatant cruelty of it all. I was able to find a way to live with our blood stained past by telling myself we are building toward a meaningful present and future. But what does Thanksgiving mean if we are moving toward defining ourselves as a nation of cruel and selfish monsters? Vladimir Putin told the Orange one that he had not interfered in our U.S. elections. Despite quite a bit of evidence to the contrary amassed by our own government, that was good enough for you-know-who. More recently, Roy Moore has been denying the various allegations against him of sexually assaulting teenagers and children, despite quite a bit of evidence to the contrary. Similarly, his denials seem to be good enough for you-know-who. After all, why would anybody who was actually guilty of a crime insist on maintaining their innocence? That would not be logical. I can sort of see the point. Once you start down the road of assuming that people who insist on their innocence might have something to hide, all sorts of mischief could follow. They might even be required to turn over their tax returns. Today I decided to explain to my class a simple technique I use in my research. I had worried that it would be too simple, and that there would then be lots of time left at the end of the class. Well, it didn’t work out that way. The “simple” technique turned out to be composed of other techniques that I had forgotten I’d implemented. And each of those techniques had subtleties to them that I had forgotten about. By the time we were done, we had used up two solid hours of explanations, discussions, examples, math equations, source code and whiteboard drawings. What had seemed like a simple topic had turned out to be a deep dive into software design, algorithms, aesthetics, data structures and GPU techniques. Maybe the easiest way to think of it is that algorithms are fractals. I wonder now why I ever thought such a thing would be simple to explain. On the positive side, we sure had fun. You are currently browsing the Ken’s Blog blog archives for November, 2017.